Another round of this offer has gone out. Valid until 11/23/2018. Sent out via e-mail, subject line is ‘Congrats, we’re grateful for your loyalty, now you’re invited to request an upgrade for your credit card!’. No link is offered as the links are unique and tied to card number. These Amex upgrade offers typically don’t have any sort of lifetime language so even if you’ve already gotten a bonus on the Blue Cash Preferred card it should work. And it won’t show up as a new card account to count against your 5/24 so there really isn’t downside in taking up the offer assuming you already got the BCP bonus and assuming you can meet the spend. Definitely worth logging into your Amex account to see if the offer shows. Should be a net gain even if you won’t utilize the higher cashback rates at all, and more-so if you’ll gain from the 6%/grocery and 3%/gas-dept earnings rate. I have this offer for $250 on $2k but with a prorated annual fee based on my anniversary date (charged 45 days after upgrade). Thanks for the heads up, I decided to make the journey under 5/24 this year as I was somewhat close-ish after a period of inactivity, so this is a perfect thing to do in the meantime. The upgrade offer had been showing for quite a while (at least in the past several months), not at this moment though. If I go to view all charge and credit cards when logged in, it still gives the $250 upgrade offer. I think the difference between the $150 and $250 offer is the former comes with intro $0 annual fee while the latter doesn’t. Same here. Been having this offer atleast for the last few months. I just checked and $250 offer still shows up when I login. Recently got an Amex Gold but that did not have any impact on this offer. Will take the offer as soon as I hit the Spending for Amex Gold. No Brainer this offer is. i have this as well. seems like a no-brainer right? If you already had the BCP’s signup bonus, yes. Otherwise, you’d become ineligible for that. How is that better? It’s currently $200 on $1000 spend for new customer. Is it like if you get a new card, you still are eligible for this upgrade? As in won’t AmEx know you would have 2 BCP? I am thinking of holding off until after Q2 (5% Grocery quarter) and hoping the upgrade offer is still around in late June. Agreed. Why start with the upgraded AMEX now when you could be getting 5% back from CHASE Freedom AND Discover 4/1-6/30? Much better to convert mid-June. Because they expire. Have to decide if it’s worth it or not. The Golden 1 credit union platinum credit card is superior to that of the AMEX blue cash Everyday credit card as it gives you UNLIMITED cash back on groceries and restaurants and credits your cash back each month in your savings account. Anyone can join this credit union, I have this credit card. Certain Credit unions have more generous cash back, least restrictive, and much lower interest rates than the big mainstream big banks. If I want to join Golden 1 I would need to join the financial fitness association for $8/yr. Can I remain a member of Golden without paying for the FFA $8 every year after the first year? Pay tribute once, 1st year or every year? So, to be clear, $8 once to get CU membership via FFA membership then done and can remain CU member? $8 to FFA every year to maintain eligibility for CU membership? Just called the Golden1 credit union representative Nd he said you just pay the DNA once and you’re in the club, must maintain $5 in their free savings to get the 3% cash back on groceries and restaurants, sweet and simple. Hopefully the rep. knows what he is talking about. I thought maybe you’ve had the card for +1 year and could pass on your actual experience if your membership was via FFA. Just called the Golden1 credit union representative and he said you just pay the FFA once and you’re in the club, must maintain $5 in their free savings to get the 3% cash back on groceries and restaurants, sweet and simple. You again. Missed the signup bonus. Again. Sign up bonuses are wonderful if it’s available for that particular credit card, but shouldn’t be the only factor in deciding what credit card to get or not get. This credit is rare as it gives you UNLIMITED cash back on groceries and restaurants, it’s more a keeper than a churning credit card. Remember too, that 4.4% cash back is only when you spend exactly $6000/yr. If you spend less or more, the percentage cash back decreases the further away from $6000 you are at the end of the year. I totally agree with you, the AMEX blue cash preferred credit card is a quasi-scam as you’re mathematically only earning 4.4% cash back on groceries, not worth paying $95 annual fee just to get 1.4% cash back more for groceries. The Golden 1 credit union platinum credit card which gives you UNLIMITED cash back on groceries and restaurants is the better choice than the 2 amex blue cash credit cards. Yes the $85, however there is the Chase Freedom credit card, discover it credit card, discover it cash back match credit card, Nusenda credit union platinum cash rewards credit card that gives you 5% cash back rotating categories for groceries without a annual fee. You can always buy gift cards!! There is a way to get the maximum cash back without an annual fee just takes strategy. So with the aforementioned credit card sabove it makes the AMEX blue cash preferred credit card rather useless and obsolete. It depends, Chase and Discovery are only for 3 months ($3000 total) if one has greater spend and if one can liquidate the gift card then it adds some value (~1-2.5 % extra over 2% citi). I have to disagree. I have all of the above for me and my wife. We max them all out. 4.4% back on 12k is still better than 3% no matter how you slice it. We also max out all the 5% options but limited to only $1500 1Q per year. My wife and I also have the blue cash amex and get the 12k @3% cash back too. The UMB Simply Rewards™ Visa® Credit card is much better. Earn three points per dollar spent at gas stations, grocery stores, discount stores, restaurants and fast food locations. Earn one point per dollar spent on other purchases. No cap on rewards. Looks good other than the redemption of points being more.clumsy/cumbersome than the automatic Golden 1 CU process. I’ll have to call them, nowhere does it detail the rewards points earned. I had the same offer a few months ago and I did the upgrade. When I chatted with AE this morning to find out what was the date I did the upgrade, which I forgot, I was told that I was not eligible for the bonus because I had the same card before. I told the rep that it wasn’t a welcome bonus and it was an upgrade bonus. Then the rep said it was a “welcome upgrade” bonus. At this point, I was suspecting I was chatting with an incompetent agent so didn’t push it further. Just a side note and see if you guys thinks she was correct. i did one of these upgrade offers about 1.5 years ago.. and now I have a brand new upgrade offer (for $250) so I’m curious if there’s any truth to this or not. EDIT: Dang didn’t realize the post I was replying to was so old. Oh well. I hope it’s still helpful. Unless something has changed, this isn’t true. I assume my gravy train will stop eventually but it’s still chugging along. I did this a few weeks back. I think mine was 1k $150. I met it, got the credit then downgraded before fee hit. You downgraded before the pro-rated fee came or the full year fee at the anniversary date? I believe I would have been charged the full fee bout a month and a half after the upgrade. I “canceled” the upgrade, an option that AMEX gave to me for 45 days. Their terms say that they can take the credit back if you cancel/downgrade within 12 months. I didn’t “cancel” nor “downgrade” the card. Canceling the upgrade means you technically downgraded. Because, the upgradation processes instantaneously. I would be happy if that is not the case. But I have my concerns. I have a question.. I realize that AmEx added the language within the last year or so that the upgraded card must be kept for “12 months” otherwise they have the right to clawback the $250 bonus. But I want to ask honestly whether anyone here has downgraded it recently (within the last year or so) before the 45-day mark to avoid the $100 annual fee? I upgraded my card and I just managed to spend 2k.. I’m still under the 45 day mark for another week or so.. and I really don’t need the card.. I also don’t want to pay the annual fee. I just want to try to get a better idea what my odds are that if I downgrade before the 45 day mark whether AmEx will clawback the bonus or not. I am also in similar boat. Also, I upgraded mid-anniversary year. In my case I would be charged pro rated $40 in a couple of weeks and then again $95 in August for the anniversary new year. So I am not able to use the cancel within 30 days trick of 2nd year. I wonder if I never had BCP before and I upgrade to get the bonus and then downgrade to BCE, am I still eligible to the BCP opening bonus, if I open one? No, you would be ineligible for future BCP sign up bonuses. When you convert/upgrade, does it hit your credit report as new card and count towards the deadly 5/24? There’s another way of looking at this for some of you. The “easiest” way to do the 2K spend to receive the bonus is through MS. But there are reports of AMEX being sensitive to that technique and clawing back the bonus or even shutting down accounts. The bonus is nice, but your main incentive in upgrading the card is the incremental cashback percentage increases. Therefore, I am suggesting that those of you with the $150 offer which waives the fee consider accepting but don’t concern yourself with the bonus. You’ll get a year of 6% back on groceries with no required spending at all. Where do you view these offers after you log into your amex account? Mine showed up under “Amex Offers”. I have old Blue from AMEX from many years ago. Can it be upgraded to anything? I also have Old Blue and it is the most used credit card we have. You have to do the math to verify that it fits your spending patterns. I would be careful about eliminating your account since the public signup is no longer available. The most likely product change would be to Blue Cash Preferred because of reduced annual and bonus category spend. Our net return on this card is 2.5 % to 2.7% annually. @jimT, I have the card for 15+ years and plan to keep it. Couple of reasons: 1. it increases my average credit life. 2. 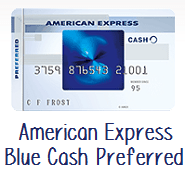 I notice that among my 5 AMEX cards, Blue account receives the most AMEX offers. Only interested in upgrade that is not treated as a new card. You have the Old Blue Cash card and not the Preferred? I will have to check out the AMEX offers on each of my cards based on your statement. I have the AMEX Starwood and the no annual fee AMEX Hilton. Old Blue Cash is our mainstay card. Have a nice day. @jimT, Mine just says “Blue from American Express”. Blue from American Express is a very old card; it earns exactly one MR per dollar spent. I know it well; in fact, I had one for many years. Is this the card you mean? Has anyone tried to downgrade to BCE in hopes of getting an upgrade offer? My annual fee is coming up on BCP so thinking of calling in to hear about retention offers. Worst case, I can downgrade and use Discover and Chase in Q2 (5% grocery bonus) then upgrade right before Q3 hits. About 1 + year ago I downgraded my BCP to BCE. At the time there was a similar ofer to this one that I was hoping to get. I didn’t get that offer, but when I logged in today, I was the $150 bonus. I’ve gotten the upgrade offer twice so I’ve done BCP>BCE>BCP>BCE>BCP Going to downgrade again to BCE when the anniversary date is near. Unless you mean downgrading hoping to get an immediate offer to upgrade, don’t think that would work. Just downgraded last month and now I see the $250 upgrade offer… bingo! exactly what I plan on doing when my AF comes up…. Is the account number or card number going to change downgrading from BCP to BCE? It didn’t change for me.